This tactic has been built to recreate my FM17 Rock Solid tactic but being more effective on the scoresheet. The back 6 are the creative force on the tactic, with Ball Playing Defenders, Complete Wing Backs and Deep Lying Playmaker, they will all need decent passing and the Wing Backs will also need pace and crossing, with crossing being more important, they will be the ones doing most of the assists. The Deep Lying Playmaker is both a creative force when attacking and an extra man to pressure the opposition while defending, he is what will better connect the space between your defensive line and your midfielders. Here you think Pirlo when searching for a player. On the midfield you have 2 Box to Box that will move up the pitch. Their main focus is to both offer offensive options when attacking but still recover the balls high as possible. On the wings you got my normal Inside Forwards, they will cut inside dragging the defense with them and making room for your Complete Wing Backs to move up with the ball and get the crosses. Up front you have a lonely Pressing Forward. Such a good role to have on this FM, it does what Defensive forward did but now with the option of attacking and thats what I go with. Some times you will see him wondering down the flanks, don’t worry, he’s dragging players with him and creating opportunities. Along with this tactic goes another 433 but with a Ball Winning Midfielder, this tactic is to be used when finishing off games so you can rest your players because the main tactic is very intensive and can cause some injuries closer to the end of the match. It can also be used in case you have a slow back line that cant play with a very high defensive line. 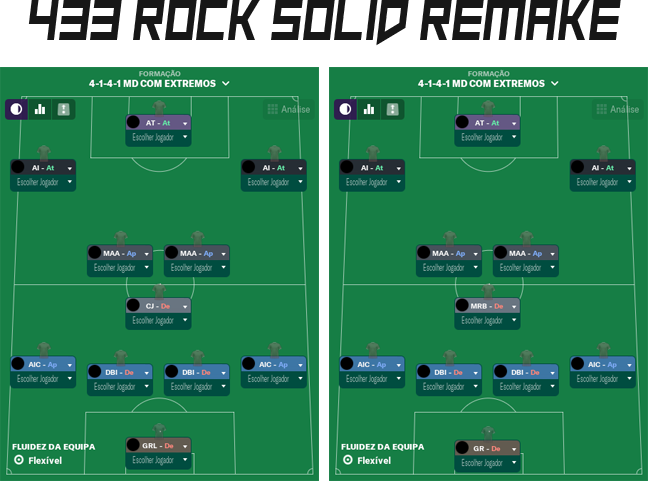 Esta tactica foi construida para recriar a minha tactica Rock Solid do FM17 mas sendo mais eficiente no ataque. Os 6 jogadores mais recuados são a força creativa da tactica, com Ball Playing Defenders, Complete Wing Backs e Deep Lying Playmakers, Vão todos de precisar de passe decente e os Wing Backs vão precisar de velocidade e cruzamento, sendo cruzamento mais importante pois eles serão quem fará maior parte dos passes para golo. O Deep Lying Playmaker é a força creativa no ataque e o home extra para pressionar os adversários na defesa, ele será o elo que melhor ligará o espaço entre a linha defensiva e os médios. Quando procurarem um jogador pensem no Pilro. No meio campo tem 2 Box to Box que irão subir no terreno. O foco deles é oferecer opções ofensivas quando no ataque bem como recuperar bolas o mais alto no terreno possivel. Nas alas tem os Inside Forwards que geralmente uso, eles vão cortar para dentrolevando consigo um defesa criando espaço para o Complete Wing Back entrar com a bola e cruzar. Na frente tenho um Pressing Forward. Um role excelente neste FM, faz o que o Defensive Forward fazia mas agora com uma opção atacante e é essa que uso. Ás vezes vão ver que ele descai sobre as alas mas não é nada de preocupante, ele geralmente arrasta com ele um defesa criando oportunidades. Juntamente com esta tactica segue um outro 433 mas com um Ball Winning Midfielder, esta tactica é para ser usada para acabar os jogos para que os jogadores descansem um pouco pois a tactica principal tem uma grande intensidade que pode causar leões perto do final do jogo. Tambem pode ser usada no caso de a linha defensica ser lenta e não conseguir jogar com a linha defensiva alta.